Home / machine head / reviews / Review || Machine Head - "Catharsis"
Review || Machine Head - "Catharsis"
On January 26th, Machine Head released their ninth album, "Catharsis" via Nuclear Blast records and I am gonna be honest; I have many, many mixed feelings about it. 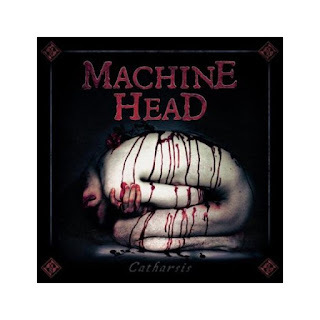 Oh boy, it feels like Machine Head pulled a Suicide Silence (equally unsuccessfully), trying to mix their style with some Nu-Metal riffs and influences to appeal to a younger target market. The overall result was better than I thought as the controversy around this release blew out of proportion among the fans and press alike, with mainman Rob Flynn's caustic remarks only adding fuel to the fire. From my perspective this is "The Blackening"-turned-Nu, and I think it's amazing that they managed to extract feel from that masterpiece to another record and not screw everything up completely. The record starts with “Volatile”, which is a skillful combination of Machine Head's formula with Nu metal influences. It's a great choice for an opening track, if you ask me. Moreover this track was written and recorded on the same day that Charlottesville events took place and is dedicated to the attendants who were injured and died during the protest. Up next is “Catharsis”, followed by “Beyond Pale”. The title track is a decent song reminiscing the style of "Bloodstone & Diamonds" while “Beyond Pale” is too Nu-metalish for my taste but a a well-rounded song nonetheless. And that's pretty much where the album lost momentum. As I listened to the following tracks, with the exception of “Screaming At the Sun”, I realized the compositions gradually started losing their Machine Head character -and I started losing interest. “California Bleeding” has a pretty cool hook but nothing special; “Triple Beam” feels like a filler, drawing elements from alt metal and transitioning from rapping to singing slightly out of key, while "Kaleidoscope" I'm guessing was meant to be a rebellious hymn. The intro definitely didn't help but the main body of the song is quite catchy and interesting. “Bastards” is basically a country song on steroids with punk vocals. Flynn is probably taking pride in the song but I have a feeling the fans disagree. Is it acoustic? Not completely. Is it a normal track? Certainly not. Is it catchy? Meh. It's got a little bit of everything thrown in when it really wasn't necessary. The last couple of things I want to talk about are the songs “Screaming At The Sun” and “Heavy Lies The Crown”. The former has that Machine Head vibe that I expected the entire album would have, but was proven wrong. The whole vibe feels like it was written for "The Blackening", and I wish more songs felt like that. However, the latter feels like a rip-off (around the 02:40 mark) of Lamb Of God's “Shoulder Of Your God”. The disc disappointed me, to say the least. "Bloodstone & Diamonds" set the bar pretty high and created many hopes and expectations. Rob Flynn's midlife crisis is more than obvious in his lyrics and, while it's good to see lyrics reflecting social issues, this time he probably went overboard.